Theodore Elyett Wins Second Mission Catwalk Challenge – Bahamian Designer Theodore Elyett secures his second Mission Catwalk challenge victory with a hand painted ensemble that wowed the judges. 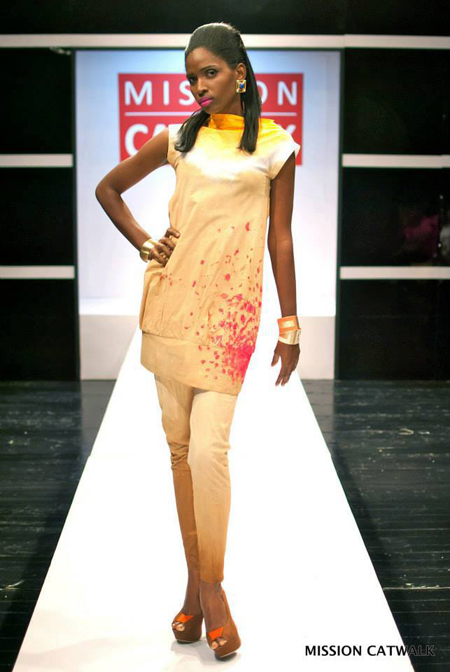 Elyett is the first designer of Mission Catwalk season three to win two episodes and have two looks retail at Lee’s 5th Avenue in Kingston, Jamaica. Nassau, Bahamas – For the second time in just seven episodes, Bahamian designer Theodore Elyett has emerged the challenge winner on Mission Catwalk, beating out seven other designers from around the Caribbean to secure the win. On episode seven, designers were challenged to transform 5 yards of white cotton fabric within 8 hours by painting a motif that represents their personality. While the other designers by and large opted to construct dresses or skirts, Elyett surmounted the competition by constructing a challenging tailored ensemble consisting of a cap-sleeve blouse and cigarette pants. The blouse featured a bold orange graduated collar and a hand painted, florescent pink floral design paired with cigarette pants. The entire look was hand painted to have an ombré effect - which Elyett commented reflects his multifaceted personalty. The gradient colour palette bled from a hint of white into a sand color at the bust, followed by taupe, caramel and then a woody hazelnut hue at the hem of the pants. “I chose to design a loose fitting blouse and slim fit cigarette pants to interpret my easy going spirit, which still has an appreciation for structured living, discipline and order,” stated Elyett. Elyett’s win makes him the first designer in the competition to win two challenges and have yet a second design offered for retail in Lee’s 5th Avenue in Kingston Jamaica, which carries reproduced looks of each week’s winning design. Given Mission Catwalk’s theme ‘Runway to Retail’, the judges commented that Elyett’s design was immaculate, very well constructed and ready for retail straight from the runway. Adding to his success on the show, Elyett has remained the ‘fan favourite’ for six consecutive weeks. The eleven-week series will culminate with a showdown between the top three remaining designers all vying for the opportunity to show a collection at London Fashion Week.